Q: I just entered my order and haven’t received a link to download the book…did you get it? A: Sometimes it takes 30 minutes to process…you’ll get an e-mail with instructions shortly. Q: Do you sell hard copies of the book? A: No, I’m sorry. Because I don’t expect huge volumes of sales because it is such a targeted subject matter it doesn’t make sense to incur the publishing expenses. Unless the demand exceeds what I think it will be, it’ll be available as a download only. Q: $29.95 for a book…are you insane? A: Probably…I’ve tried to convey all of my 25+ years of experience in guiding you toward a tractor purchase that you’ll be happy with, and help you save money in the process. The average new tractor/attachment package sells for $20,000+, a $29.95 investment seems like a small price to pay to get it right the first time, and I bet you save way more than the price of the book when you buy that tractor. Q: Do you offer coupons? A: Yes…pledge one monthly $5 contribution to my Patreon account and take $10 off the book. Cancel Patreon after one month and you saved $5, and we’re still friends. Here’s the link to my Patreon page: https://www.patreon.com/TractorMike. Q: I’ve pledged $5 to Patreon…how do I get the coupon? A: Until I figure out a better way (which might never happen), I’ll be notified that you’re a Patron, then I’ll create a coupon code and e-mail it to you. It’s a cumbersome process, but I promise I’ll get it to you. Sorry for the delay! Q: I’ve never downloaded a book…will it hurt? A: I never had either and I promise it won’t hurt. I’m a tractor guy, not a tech guy, but it worked like a charm! I use a service called BookFunnel and they seemed to have worked all of the kinks out of the process, even for non-tech guys like me. Q: Couldn’t I just watch your videos and not have to buy the book? A: There’s some stuff in the book that I won’t be covering in the videos. Mostly about pricing and negotiation. Please don’t share where you learned it from with a dealer or company rep! Q: I’ve lived on a farm and bought multiple tractors…is there anything in the book for me? A: Probably not. You might pick up a couple of tips that help you in future purchases, but it’s really targeted to the core group of my viewers…folks who have moved to the country and are shopping for a tractor for the first time. While hosting the Tractor Mike YouTube Channel, and reading every question and comment that gets posted, it became very clear that many people who are shopping for their first tractor end up having a bad experience. Between not being exactly sure what they need, to trying to know whether to trust the dealer, to not understanding tractor lingo, etc., there are a lot of things that can intimidate the first time tractor buyer. I hope, through my videos, that I have helped many of you through the educational process about tractors in general, to select the right size, to find a good dealer, to get the right attachments, and so on. I thought there was a need to take it to the next level, and to put all of the advice I can offer in one place, in an e-book to help take the stress out of tractor shopping. I actually look forward to going out and looking at tractors, but I’ve been in the business for over 25 years, as a factory rep, as a dealer, and now as a YouTube video creator. My goal was to put all of my knowledge in one manual, to help new tractor shoppers negotiate a great deal, and come away from the experience without a lot of stress and with a good relationship with a dealer who will take care of them. 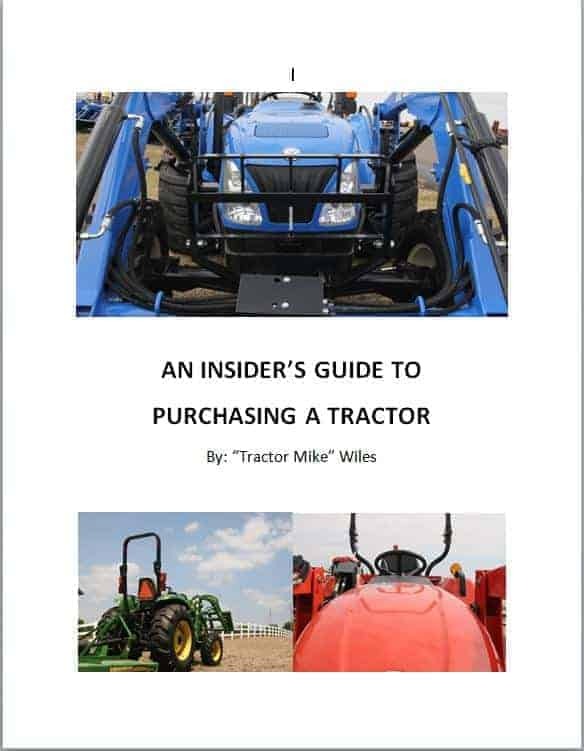 In “An Insider’s Guide to Purchasing a Tractor”, I discuss selecting a brand/dealer, tractor options, what size to get, which implements you might need, the shopping experience, negotiation, and buying used. I share some inside secrets that I’d prefer tractor manufacturers and dealers don’t see. Hopefully after you’ve read the book you’ll get the exact right tractor you need, develop a great relationship with a dealer who will take amazing care of you, and negotiate a deal that saved hundreds, if not thousands, of dollars. In writing the book I try to give you advice like I was right there with you throughout the purchase. I hope you enjoy the book and up with the perfect tractor for you exact needs.